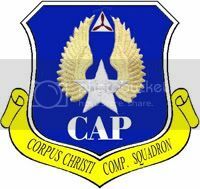 It says it all...were from TEXAS (via the Texas wing patch lonestar), were CAP ("CAP" and the Tri-Prop) and were from Corpus Christi (via the scrolling). I'm gonna get a contest open to see who can design a better one. Can we foreigners from North Texas enter the contest? If I may be so bold, and you can answer in PM, where do you get your patches made? And at what cost? We will consider any an all suggestions. I must say I enjoy any help I can get. You should go with this format for heraldry reasons. I'm sure someone's said that already, it's all over the front of this thread. Sq's use circles & arches. Technically you should have the Sq name all on the bottom rocker also & either not have a top rocker unless you wish to put a motto there. I'd stick to the triangle/prop you have though versus majcom there. The Majcom is too much detail that small & our Texas Wg/Star isn't from the current AF logo but rather the oldschool mod of the WWII design we have on our Wg Patch. Also, what are your thoughts on red rockers? That'd give it a real connection to the Wg patch, which we may not be keeping on BDUs w/ the new & subsequent Wg CCs. Anyone want to photochop me a squadron patch using the National Guard type Minuteman? Design our unit patch...I'll present it to the unit had see what they think. If they approve it, I'll back their descision and credit the designer in our unit history. Maybe, in a few months when I've played a few more gigs...I make up a few. CONUS, Alaska and Hawaii...give it your best. Neen't be a Texan, although it would be nice. I can, but that's a fairly distinctive symbol, is there some really good reason you're using it? cause a lot of people are going to think that means you're a guard unit, including the guard. Joe, I'll shop up what I just recommended & you can keep the credit if you want to use it. Just make it look good is all I ask. Lt Col Pocher Minute Man Sq. Used to be located at Minute Man Airfield (6B6) in Stow, MA... Which is also not to far from the Lexington and Concord area where the actual statue is located. I like the weathered (greenish) look better. It would also make it a bit more distinctive than the Air Guard version. If I were to have this patch made...how would I go about that? Search online & local embroidery shops, compare prices & make patches. Read back earlier in the thread actually, I believe there's some discussion on prices & vendors. I'm not an expert. Far as your motto... I got no latin skills. How's this one feel, "officium et aeris" or aeris et officium, doesn't matter. That's service/duty & flight in the air. You should also investigate local embroidery shops, we're using one and had much better luck quality-wise than with some of the online-places. A local shop will be able to hook you up with non-uniform "affinty wear" stuff like polos, etc. Don't skimp on the price - go full-stitched instead of using cloth with the field color, makes a HUGE difference. Yes, per patch you might be talking about $3 vs $5, but its represents your unit, you may wear the thing 10 years, and you only need a few. I would also suggest triple-checking any latin translations, there are lots of online services, but some contradict each other. Note, inserted one of those mottos to the root image above, so it's changed. Okay, I'll give it a try, but give me some more info. You have a past design, more on Pocher, unit history, more on the area & Wg, motto.... anything you particularly want included? Colors you want to use & why those in particular. I should be able to whip something together pretty fast. Here's what 2-1/2 years of work, and the best Chinese manufacturing can get you. We just got them from the vendor this week. OH! OH! ME! ME! That turned out REAL nice! Would it be possible to purchase 3 or 4 from your squadron yet? Let me know, I'd really like to preserve one right next to the older one in my display, as well as on the website. BTW, I like the "owl vs rat" version also, heh - a great Friday patch if ever made! I added the Group III HQ patch and history to the Visitor Submissions section of the Texas Wing section of the CAP Patches website. HOWEVER, you say you've got one or more with my name it now?! ALRIGHT!!!! Let me know where to send the $$$. And evenif patches aren't available, I shodl get you the art from the various patches in Group 22 and the Group shield. Just something simple with the Minuteman. I was thinking offset the Minuteman to the left side of the patch and have three stars along the right side edge for the three missions, or incorperate the tri-prop somehow. I would like it on a dark blue background, with other darker colors so it will look good on the BDU without actually being subdued. Like I said, I like the greener Minuteman that looks more like the actual statue. No motto, but the unit name should fit on the bottom... I've tried it once before and it meets specifications IIRC. Should try to meet USAF specs as much as possible. I think there's nothing wrong with using >a< minuteman, but using >the< minutemand from the guard is iffy, unless you guys have a direct connection to the guard through a base or similiar affinity. Perhaps a minutman flying in an airplane, etc. Its problematic enough to use elements from USAF insignia, but at least there we have a connection.